During the Great Recession, many people lost their homes to foreclosure. Lisa Trammel was about to become one of those people, and she wasn’t happy about it. So she hired a attorney, launched a website, and organized a protest movement that she named FLAG: Foreclosure Litigants Against Greed. Her lawyer is Mickey Haller, whose criminal defense practice has fallen on such hard times that he’s taken up foreclosure litigation to make ends meet. Then Trammel gets arrested for murdering Mitchell Bondurant, the mortgage banker who was foreclosing on her property. A witness puts her at the scene, as does a microscopic amount of DNA on her shoes and a hammer. It looks like a cut-and-dried case for the prosecution. But when Haller digs into the case, he discovers solid evidence pointing to his client’s innocence and the potential guilt of another party with connections to the mob. When he is savagely beaten by two thugs, his determination to clear his client only grows. Will he succeed in clearing his client and catching the real killer? 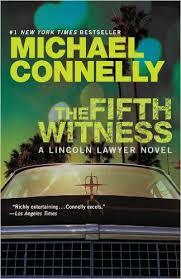 As with Michael Connelly’s other Lincoln Lawyer books, The Fifth Witness is told in the first person from Haller’s point of view. The story builds patiently but never slowly toward the denouement. I’ve read a lot of mysteries, so I’m used to plot twists and turns, but trust me when I say, I never saw this one coming. This sounds good – I’ve found not many books can surprise me these days, so will be interested to see if this one manages it!